All transactions are safe and secure with a reliable history in online purchasing behind each of our associates. 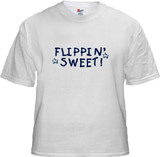 Buy the Flippin' Sweet! Napoleon Dynamite t-shirt to own Napoleon Dynamite clothing and merchandise. The word 'flip' is a euphemism that Napoleon uses in place of a much harsher four-letter word. For example, after he learns that his grandma has been injured on an ATV he says, "What the flip was Grandma doing at the sand dunes?" Steer clear of profanity with this Flippin' Sweet Napoleon Dynamite t-shirt, a reflection on the culture of Preston, Idaho. In addition to the Flippin' Sweet! Napoleon Dynamite tee above, browse the Napoleon Dynamite Clothing Gallery for more apparel like men's and women's clothes, kids shirts or hoodies.